VERY FINE. A RARE SOUND AND CHOICE EXAMPLE OF THE ONE-CENT 1851 TYPE I, SCOTT 5, WHICH COMES ONLY FROM POSITION 7 IN THE RIGHT PANE OF PLATE ONE EARLY. ONLY ONE OUT OF THE 1,000 POSITIONS ON PLATES USED TO PRINT THE STAMPS ISSUED IMPERFORATE IS THE TYPE I, WHICH HAS THE DESIGN NEARLY COMPLETE, INCLUDING THE ORNAMENTAL PLUMES AND BALLS AND TOP AND BOTTOM. ONE OF THE MOST DIFFICULT OF ALL CLASSIC UNITED STATES STAMPS TO FIND IN SOUND CONDITION. The published census compiled by Jerome S. Wagshal (available at our website at https://siegelauctions.com/census/us/scott/5 ) contains at least 98 unduplicated records of Scott 5. There are probably no more than ten examples existing outside of the Wagshal census population. 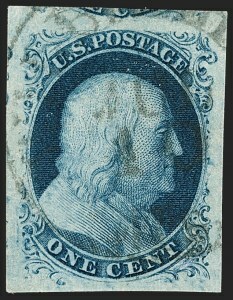 Therefore, the 1c 1851 Type I is the rarest of all United States stamps issued regularly prior to the 1868 Grills. Because of the significance attached to the outer portions of the 1c 1851 design, rare types that have been carefully cut apart, so as not to impinge on any part of the design, are extremely desirable. 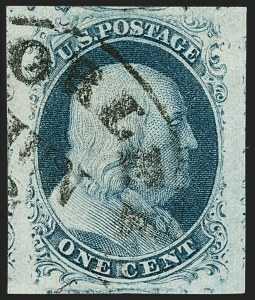 The narrow spacing between stamps in the sheet and the users' indifference to the outlying ornamentation during separation are factors that contributed to the great rarity of four-margin examples. Time has also not been kind to the surviving population, as very few are sound. The example offered here, in sound condition, with a sheet margin at top and with the type characteristics visible, is regarded as one of the finest in existence. Wagshal Census No. 5-CAN-023. Ex Neinken and Wagshal (this is the first time this stamp has been offered since Jerome Wagshal passed away -- it was not part of our series of Wagshal sales). With 1947 R.P.S. certificate. EXTREMELY FINE. A REMARKABLE EXAMPLE OF THE 1851 IMPERFORATE ONE-CENT TYPE Ia, ONE OF THE RARITIES FURNISHED BY PLATE FOUR, WITH CORNER SHEET MARGINS. Stamps printed from Plate 4 were issued in April, May and briefly in June 1857 before perforations were introduced. The relatively small number of imperforate Plate 4 stamps issued during this period explains the rarity and desirability of any of the imperforate stamp types produced from this plate (Ia, Ic, II, III and IIIa). The extremely rare Type Ia, showing the full design at bottom, was furnished only by 18 of the 200 subjects on Plate 4 (the remaining two bottom-row positions were sub-type Ic). Ex Eno, Dauer and Merlin. "W.H.C." backstamp (Warren H. Colson). With 1992 P.F. and 2008 P.S.E. certificates (XF 90 Jumbo; SMQ $33,000.00). Only five have graded higher (three at 95 and two at 98) and only one other shares this grade, but this corner-margin stamp is arguably superior to most of those with equal or higher numerical grades. VERY FINE. A FRESH AND CHOICE USED EXAMPLE OF THE 1851 ONE-CENT TYPE Ic. 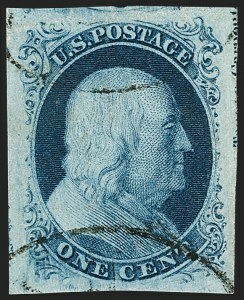 A RARE STAMP IN THIS CONDITION. This variety is often confused for Scott 6, Type Ia (F Relief), which is complete at bottom. However, this sub-type has the ball and plume at lower right slightly less complete (E Relief). Type Ic stamps from positions other than the bottom row have been widely appreciated by specialists for decades, but they were only added to the Scott Catalogue in 1993. 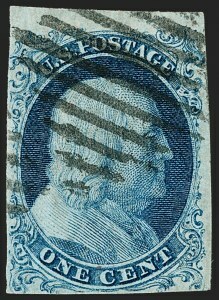 This stamp is far scarcer than its Scott value suggests, especially in sound condition. EXTREMELY FINE GEM. A STUNNING USED EXAMPLE OF THE ONE-CENT TYPE II 1851 ISSUE. With 1983 S.P.A. and 2003 P.S.E. certificates (Gem 100; SMQ $4,000.00). Frankly, today's P.S.E. graders would probably knock this down to 98J (SMQ $3,000.00). EXTREMELY FINE GEM. 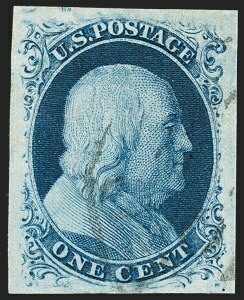 THIS MASSIVE STAMP HAS ACHIEVED THE PERFECT GRADE OF GEM 100 FROM P.S.E., AND IS ONE OF THE FINEST EXAMPLES IN EXISTENCE. This stamp has beautiful color, huge margins and an attractive cancel. Almost 350 are graded, and only five are graded 100 and three are graded 100J. With 2014 P.S.E. certificate (Gem 100; SMQ $4,000.00). Only three have graded higher and four others share this grade. EXTREMELY FINE GEM. 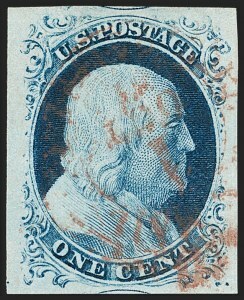 THIS POSITION IS THE ONLY TYPE II STAMP ON PLATE ONE EARLY WITH THE DESIGN COMPLETE AT TOP. THIS IS WITHOUT QUESTION THE FINEST EXAMPLE OF POSITION 10R1E IN EXISTENCE. 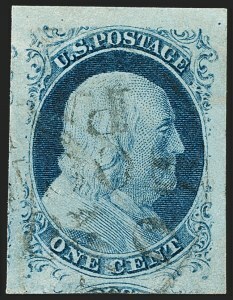 The legendary top row of the right pane of Plate One Early yields the only Type I stamp (Position 7), six Type Ib stamps (Positions 3-6 and 8-9) and three Type II stamps (Positions 1-2 and 10). These were the first positions entered onto the plate (Position 10, offered here, was the very first entered). All were originally entered as Type I positions showing the completed design using a transfer roll that was not used for any other positions. Positions 1 and 2 were poorly executed and erased. 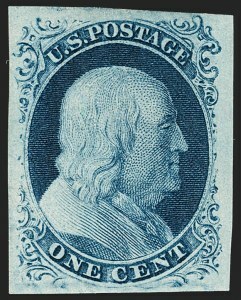 The original transfers of Positions 3-10 were kept, but small portions of the designs were burnished away at the bottoms of seven of the eight positions, turning six into Type Ib and one into Type II stamps. Only one escaped the burnishing tool, which gives us Type I (Position 7R1E). The remaining positions on the plate were entered using a transfer roll with the design incomplete at top. Only these few positions from the top row of the right pane of Plate One Early have the design complete at top, and Position 10R1E is the only Type II on this plate to display this characteristic. EXTREMELY FINE GEM. A STUNNING USED JUMBO EXAMPLE OF THE IMPERFORATE 1851 ONE-CENT TYPE II. ESPECIALLY DESIRABLE WITH FACE-FREE BLUE CANCEL. EXTREMELY FINE GEM. A STUNNING JUMBO USED EXAMPLE OF THE 1851 ONE-CENT TYPE III. 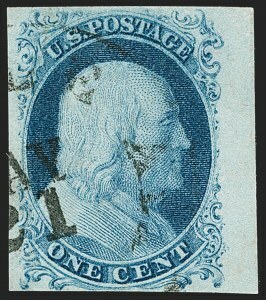 THIS TYPE IS EXTREMELY RARE WITH THE IMPRINT. THIS IS THE ONLY SOUND EXAMPLE OF TYPE III SHOWING THE IMPRINT WE HAVE OFFERED SINCE KEEPING COMPUTERIZED RECORDS. 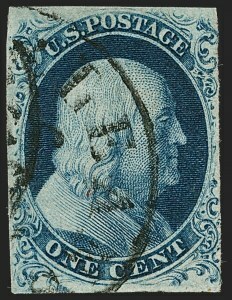 APART FROM THE IMPRINT, THIS IS ALSO ONE OF THE FINEST TYPE III STAMPS IN EXISTENCE, BY VIRTUE OF ITS HUGE BALANCED MARGINS, FACE-FREE CANCEL AND WONDERFUL COLOR AND IMPRESSION. The Neinken book states, "Stamps from Plate 4 showing part of the imprint are very rare." Looking at the layout of Plate 4 (Neinken book, page 263), the imprint position types are as follows: left pane 31/41L Type IIIa, 51L Type IIIa-III, 61L Type III; right pane 40R Type III, 50/60R Type IIIa, 70R Type III. Therefore, only Positions 61L, 40R and 70R4 are Type III imprint positions (51L is a "swing" position with a smaller break). Ex Vogel, "Natalee Grace" and Curtis. With 2011 P.F. certificate as a pair with Type IIIa and 2012 P.S.E. certificate as single (Superb 98; SMQ $21,000.00). Only two have graded higher (at 98J) and one other shares this grade. EXTREMELY FINE. 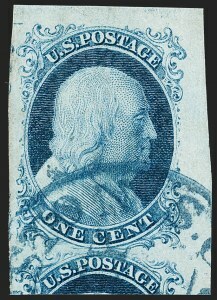 A BEAUTIFUL USED EXAMPLE OF THE IMPERFORATE ONE-CENT TYPE III. Type III is defined by breaks in the outer lines at both top and bottom. 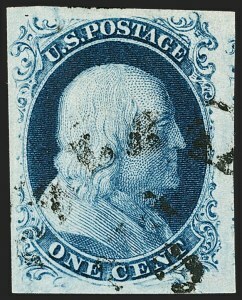 Many Type III stamps have breaks that were created or enlarged by plate wear. 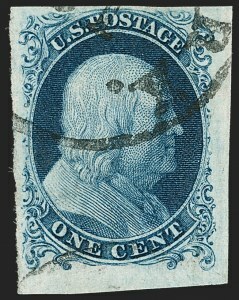 Since the wear occurred over a period of time, the majority of stamps of this type (both unused and used) has small breaks in at least one line. 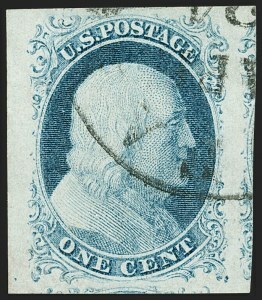 This stamp is notable for its wide breaks at both top and bottom. EXTREMELY FINE. THIS SUPERB STAMP IS THE FIRST ORIGINAL-GUM, PREVIOUSLY-HINGED EXAMPLE OF THE RARE 1851 ONE-CENT TYPE IIIa TO BE GRADED EXTREMELY FINE 90 BY P.S.E., AND IT IS VERY LIKELY TO REMAIN AT THE TOP OF THE P.S.E. POPULATION REPORT FOR A LONG TIME. Type IIIa is defined as having a break in the outer line at either top or bottom. 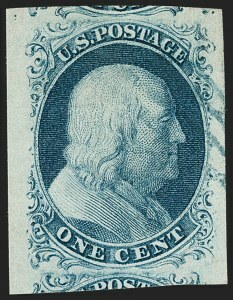 The stamp offered here, with huge margins, is an outstanding example of the type, as it clearly shows the bottom line complete and the top line with a wide break. The P.S.E. Population Report shows nothing in OG condition above 50, except for this stamp at XF 90. In the NG/RG/D-POG category there are stamps graded 85 and 95, but we have no idea what the gum condition is for those stamps. Therefore, after years of grading, this OGph XF 90 stamp lands at the top of the Population Report, and we cannot imagine any stamp displacing it, or even matching it, unless something unexpected turns up. With 2015 P.S.E. certificate (OGph XF 90; SMQ $16,000.00). Ex Kirke and Curtis. With 2010 P.F. and 2007 and 2015 P.S.E. certificates (Superb 98; SMQ $10,500.00). Only two have graded higher (at 98J) and only four others share this grade. Ex Kirke. With 2010 P.F. and 2008 P.S.E. certificates (Gem 100 Jumbo; unpriced in SMQ above the grade of 100, SMQ $2,750.00 as 100). Only ten other examples are awarded this ultimate grade.